A team of astronomers claims to have detected an enormous bridge or filament of dark matter, with a mass estimated to be of order 100 trillion solar masses, and connecting two clusters of galaxies. The two clusters, known as Abell 222 and Abell 223, are about 2.8 billion light-years away and separated from one another by 400 million light-years. Each cluster has around 150 galaxies; actually one of the pair is itself a double cluster. Clusters of galaxies are gravitationally bound collections of hundreds to a thousand or more galaxies. Often a cluster will be found in the vicinity of other clusters to which it is also gravitationally bound. The universe as a whole is gravitationally unbound – the matter, including the dark matter – is insufficient to stop the continued expansion, which is driven to acceleration in fact, by dark energy. 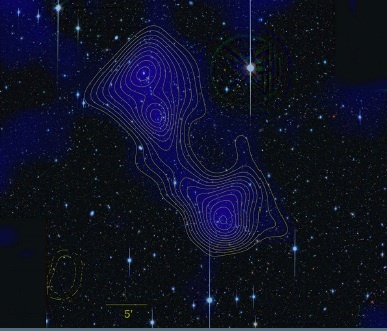 Figure: Subaru telescope optical photo with mass density shown in blue and statistical significance contours superimposed. In the filament area found near the center of the image, the contours indicate four standard deviations of significance in the detection of dark matter. The cluster Abell 222 is in the south, and Abell 223 is the double cluster in the north of the image. The distance between the two clusters is about 14 arc-minutes, or about ½ the apparent size of the Moon. Dark matter was originally called “missing matter”, and was first posited by Fritz Zwicky (http://en.wikipedia.org/wiki/Fritz_Zwicky) in the 1930s because of his studies of the kinematics of galaxies and galaxy clusters. He measured the velocities of galaxies moving around inside a cluster and found they were significantly greater than expected from the amount of ordinary matter seen in the galaxies themselves. This implied there was more matter than seen in galaxies because the velocities of the galaxies would be determined by the total gravitational field in a cluster, and the questions have been where is, and what is, the “missing matter” inferred by the gravitational effects. X-ray emission has been detected from most clusters of galaxies, and this is due to an additional component of matter outside of galaxies, namely hot gas between galaxies. But it is still insufficient to explain the total mass of clusters as revealed by both the galaxy velocities and the temperature of the hot gas itself, since both are a reflection of the gravitational field in the cluster. The technique used to map the dark matter is gravitational lensing, which is a result of general relativity. The gravitational lensing effect is well established; it has been seen in many clusters of galaxies to date. In gravitational lensing, light is deflected away from a straight-line path by matter in its vicinity. In this case the gravitational field of the dark matter filament and the galaxy clusters deflect light passing nearby. The image of a background galaxy located behind the cluster will be distorted as the light moves through or nearby the foreground cluster. The amount of distortion depends on the mass of the cluster (or dark matter bridge) and how near the line of sight passes to the cluster center. There is also a well-detected bridge of ordinary matter in the form of hot X-ray emitting gas connecting the two clusters and in the same location as the newly discovered dark matter bridge. The scientists used observations from the XMM-Newton satellite to map the X-ray emission from the two clusters Abell 222 and Abell 223 and the hot gas bridge connecting them. Because of the strong gravitational fields of galaxy clusters, the gas interior to galaxy clusters (but exterior to individual galaxies within the cluster) is heated to very high temperatures by frictional processes, resulting in thermal X-ray emission from the clusters. The research team, led by Jörg Dietrich at the University of Michigan, then performed a gravitational lensing analysis, focusing on the location of the bridge as determined from the X-ray observations. The gravitational lensing work is based on optical observations obtained from the Subaru telescope (operated by the Japanese government, but located on the Big Island of Hawaii) to map the total matter density profile around and between the two clusters. 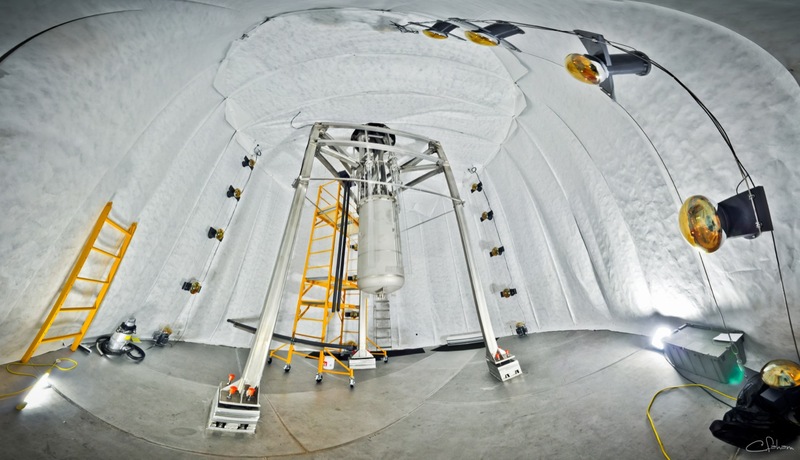 This method detects the sum of dark matter and ordinary matter. They analyzed the detailed orientations and shapes of over forty thousand background galaxies observable behind the two clusters and the bridge. This work allowed them to determine the contours of the dark matter distribution. They state a 98% confidence in the existence of a bridge or filament dominated by dark matter. The amount of dark matter is shown to be much larger than that of ordinary matter, representing over 90% of the total in the filament region, so the gravitational lensing effects are primarily due to the dark matter. Less than 9% of the mass in the filament is in the form of hot gas (ordinary matter). The estimated total mass in the filament is about 1/3 of the mass of either of the galaxy clusters, each of which is also dominated by dark matter. Observations of galaxy distributions show that galaxies are found in groups, clusters, and filaments connecting regions of galaxy concentration. 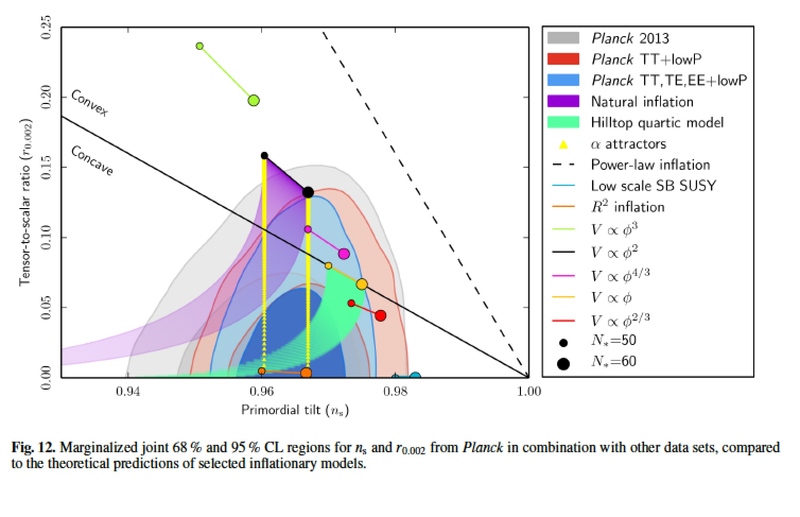 Cosmological simulations of the evolution of the universe on supercomputers indicate that the distribution of dark matter should have a filamentary structure as well. So although the result is in many ways not surprising, it represents the first detection of such a structure to date. We are immersed in a sea of light emanating from ordinary matter that is floating, as it were, on an ocean of dark matter. The dark matter itself floats on the dark energy of the particle vacuum that in turn is in embedded within the scaffolding of space-time – which is shaped by the dark gravity effects from all matter and energy.